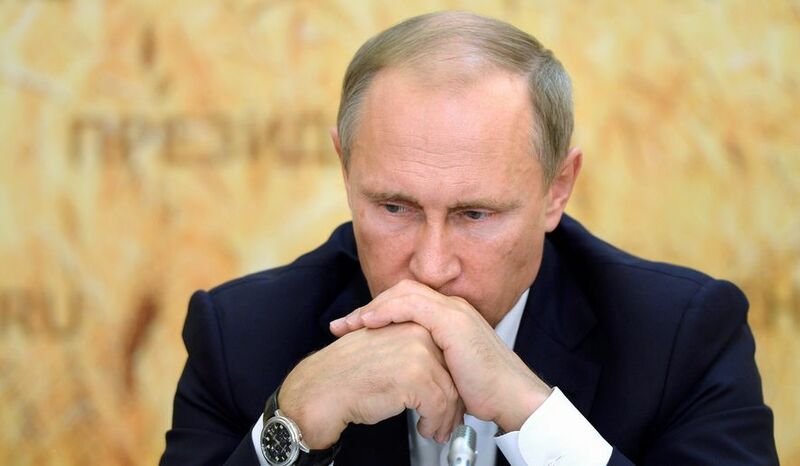 Home » Putin's Endgame in Syria: Victory or Stalemate? In a recent article for Foreign Policy magazine, Jonathan Spyer, a research fellow at the Jerusalem Institute for Strategic Studies, argued that Russian President Vladimir Putin was content with what Spyer perceives to be the current situation in Syria: A “frozen conflict” in which Putin is prepared to accept a continuous low level conflict and the de facto partition of Syria. This piece offers a different appraisal to Spyer’s argument that these were Putin’s ultimate goals and instead argues that Putin has been forced to accept the state of affairs by the machinations of the United States and its regional ally Israel, which has always desired the weakening and balkanisation of the Syrian state. “Stabilising” the government of Bashar al Assad of course meant protecting and maintaining Russia’s strategic establishments in the Middle East, namely the Mediterranean naval bases in Tartus and Latakia as well as the air base in Khmeimim. It also entailed neutralising the threat posed by Islamist militias which had conquered large swathes of Syrian territory. In doing this, Putin reckoned that he would be protecting the Russian Federation from the menace of jihadi fighters of the sort that had overthrown the government of Libya and whose overthrow of Assad would ineluctably lead to their relocation to theatres in the Muslim lands on Russia’s borders. It is important to note at the outset that Putin’s initial hesitancy in entering the conflict in an overt manner was, unsurprisingly, to do with the fear of becoming bogged down in a protracted conflict as had occurred with the Soviet Union in Afghanistan. Whatever the perception is of Putin in terms of the power he wields at the helm of the Russian state, it is clear that domestic opinion in regard to his foreign policy decisions are never far from his mind. It is also essential to point out that while Spyer claims that Putin has “initiated and managed such conflicts elsewhere, including in Georgia and Ukraine”, a more faithful recollection of the instigation of those conflicts places responsibility on other parties. The brief Russo-Georgian War of 2008 was prompted by the incursions into South Ossetia ordered by the then Georgian leader, Mikheil Saakashvili. Saakashvili would not have initiated this action by his Israeli-trained and equipped army without the prompting of the United States. Likewise the Ukrainian conflict was prompted by an American sponsored coup that was overseen by the then US Assistant Secretary of State for European and Eurasian Affairs, Victoria Nuland. In regard to the former, Russia completed a withdrawal from Georgian buffer zones in October 2008. So far as Ukraine was concerned, seeing the threat posed to its Black Sea naval fleet by the installation of an overtly Russophobic regime in Kiev, Putin, on the advice of the relevant national security body, decided to annexe Crimea after the completion of a referendum. Both actions were clearly measured responses to what were perceived to be American-sanctioned provocations on Russia’s borders. Russia did not militarily overrun Georgia, a nation which had for centuries been a part of both Russian and Soviet empires. And in the case of Ukraine, a country which critics claim is coveted by a supposedly revanchist Russian state, Putin resisted calls from Russian ultranationalists to invade the eastern part of the country and declare a state of Novorossiya. Instead, it is clear that a combination of Russian nationalist volunteers and the covert deployment of Russian special forces have aided the militias of the separatist proto-states of Donetsk and Luhansk. Russian military engagements in these countries have therefore been reactive rather than proactive. The same can be said of Syria. For Russia had stood by in previous years after the United States had invaded or destabilised country after country in order to achieve a so far undeclared geo-political aim of taking out seven countries in the aftermath of the September 11 attacks of 2001. Starting with Iraq, the list included Libya and Syria, and was to culminate with the destruction of Iran. Each of the aforementioned countries did not espouse the Wahhabist strain of Islamism claimed by the alleged perpetrators of 9/11, but happened to stand in opposition to Israel. Roland Dumas, a former French foreign minister, quoted a former Israeli prime minister as telling him that “we’ll try to get on with our neighbours, but those who don’t agree with us will be destroyed.” Dumas has asserted that the Syrian War was “prepared, conceived and organised” by the Western powers at least two years in advance of what became an insurgency. And the insurgents have had the covert backing of the United States and its regional allies including Saudi Arabia and Israel. In concert with Iranian military advisers and units of the Lebanese militia Hezbollah, it is likely that the Russian intervention would have enabled the Syrian Arab Army to have purged Syria of the likes of al Nusra and the so-called Islamic State at an earlier point in time, but for a number of ill-timed withdrawals by the Russians such as occurred in March 2016 and December 2017. There have also been a few ill-judged ceasefires. The Syrian Army would also have been capable of liberating the whole of Syria, but has been hindered by continuing illegal interventions by the United States. Whereas the overt Russian involvement in Syria stems from a formal request made in July 2015 by President Bashar al-Assad, the United States, which nominally respects the territorial integrity of the country by virtue of its formal endorsement of UNSC Resolution 2254, has worked towards the de facto partition of a sovereign nation. And the instrument of this policy has been its support of Kurdish militias, which has been facilitated by the establishment of two military bases in eastern Syria. The balkanisation of Syria has been a long-term objective of both the United States and Israel. When in July 2006, the former US Secretary of State, Condoleezza Rice called for a ‘New Middle East’, she was alluding to the neutralising of the ‘Shia Crescent’ consisting of Iran, Syria and Hezbollah. The means of achieving this was to foment disorder and violence on a scale which would bring about a lasting change to the region. It was a struggle in which Rice insisted that the United States and its allies “will prevail”. In June 2006, a map prepared by a retired US Army Lieutenant Colonel named Ralph Peters, was published in the Armed Forces Journal. It depicted a redrawn Middle East including a Kurdish state, which would consist of an amalgam of territory ceded by four countries including Syria. Achieving the fragmentation of Syria using militant Sunni proxies was a clear objective in more recent times. A declassified Defense Intelligence Agency (DIA) document from August 2012, clearly stated the desired policy of “establishing a declared or undeclared Salafist principality in eastern Syria”. However, given the Russian-aided Syrian Army victories over jihadist militias, the United States has used Kurdish militias such as the YPG as a means of keeping this goal alive. These militias control Syrian territories east of the Euphrates River, which include Syria’s major oil producing areas. They have also been actively ethnically cleansing areas under their control of Sunni Arabs, including the majority-Arab city of Raqqa. Condoleezza Rice’s comments regarding the “birth pangs” of a ‘New Middle East’ were made in Jerusalem to Ehud Olmert, then the prime minister of Israel during the war between Israel and Hezbollah in 2006. Her statement was welcomed, given that it represented a meeting of minds between the United States and Israel. Syria will fall apart in accordance with its ethnic and religious structure, into several states such as in present day Lebanon, so there will be a Shi’ite Alawi state along its coast, a Sunni state in the Aleppo area, another Sunni state in Damascus hostile to its northern neighbour, and the Druzes will set up a state, maybe even in our Golan, and certainly in the Hauran and in Northern Jordan. Although the passage does not refer to a Kurdish state, Israeli policy has encouraged the development of autonomous Kurdish territories first in Iraq, and then in Syria. Israel has had long standing political and intelligence connections with the family of the Kurdish-Iraqi leader Masoud Barzani, and it supported the referendum vote on independence in 2017. It also became the first state to endorse an independent Kurdistan. Along with the political motive is an economic one. In August 2015, an article in the Financial Times reported that Israel was importing as much as three-quarters of its oil from Iraq’s semi-autonomous Kurdish north. It is clear that Israel would seek to benefit similarly from the oil reserves of a declared or undeclared Kurdish state in Syria, just as it intends to exploit the oil reserves believed to be hidden in the depths of the Golan Heights, acquired from Syria in the war of 1967, and illegally annexed in 1981. This carving up of Syria would of course have not been possible to achieve if the Kurdish militias had aligned themselves to the Syrian-Russian effort. Instead, they chose to combat the jihadis under the umbrella of the United States. And in doing so, the risk of a confrontation between two nuclear armed powers has acted as a check on how far Vladimir Putin has been prepared to go. Committing more Russian resources in an effort to help its Syrian ally reclaim Kurdish-held territory would not only increase the danger of a Russian-United States conflict, it would raise the spectre of increasing numbers of Russian servicemen returning home in body bags. During the conflict, both the United States and Israel consistently sought to diminish the ability of the Syrian military to contend with the jihadist insurgency. For instance, in September 2016, the American airstrike in the eastern province of Deir al-Zour purportedly targeting jihadist militias, but which ‘accidentally’ killed over 60 Syrian soldiers and wounding over a hundred, was a cynical attempt aimed at giving the Islamist insurgents an advantage on the battlefield. The missile strikes organised against Syrian army bases after dubious allegations about government use of chemical weapons were part and parcel of this strategy. Israel, which has had a history of supporting a range of Islamist militias, has actively supported the efforts of al-Qaeda-affiliated rebels active near the Golan Heights by providing them with medical care, arms and cash. It has also, with the apparent consent of the Russians, launched its own attacks on Syrian and Iranian positions. Israel’s actions, as is the case with those of the United States, are illegal under international law. Putin has faced criticism for being ‘weak’ in accepting these persistent infringements on the sovereignty of Russia’s ally. He has reneged on a promise to supply the Syrians with SS-300 missiles, and has also called for the withdrawal of the Iranians without extracting a promise that the Americans withdraw their own troops and aircraft. Some would argue that by failing to ‘protect’ his ally and creating a rift with Iran, he is emboldening the efforts of the Americans and Israelis to undermine the control the Assad government has over the territories it has reclaimed. These critics can point to an official statement issued by the State Department on May 25th of this year, warning the Syrian Army against launching an operation in the south west of the country. In accomplishing the task of preserving the Syrian government, Putin’s intervention has frustrated the American and Israeli objective of overthrowing Bashar al Assad and the ruling Baathist Party. However, given the evidence of the long-term policies of both American and Israel in trying to engineer a ‘New Middle East’, speculation that “de facto partition” and a “frozen conflict” may have been “his goal all along” is somewhat disingenuous. The partition of Syria, after all, has been the endgame favoured by the United States and Israel, an objective both continue to work towards with ruthless resolve. As I wrote two weeks ago, the Syrian crisis is only in its beginning stages.